First we’ll need to download CoverChooser. At the moment it has no official website, but we can grab it from Gnomefiles.org, at this link. Once there, you can either install the Ubuntu installer or the standard source package (and compile yourself). You can also, if you use Ubuntu, use the personal package archive (PPA), the author has created. This allows you to always stay up-to-date. To use the PPA, first open a Terminal. 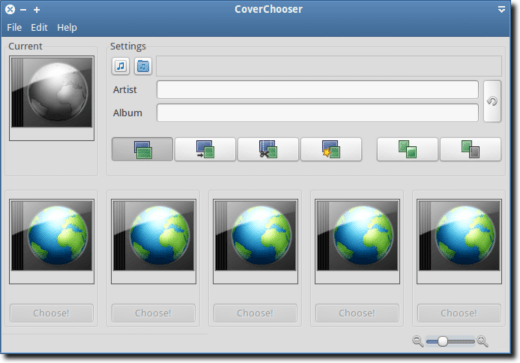 You will now find CoverChooser in your Applications menu, under Accessories. Go ahead and open CoverChooser. You’ll see a few “empty” placeholders where cover art will eventually appear, as well as spots to fill in Artist and Album information (or let CoverChooser fill them in for you). 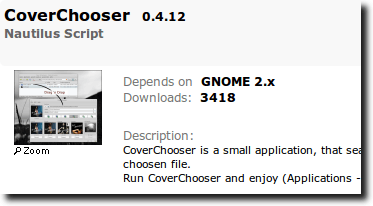 Using CoverChooser is pretty simple. If you want to find artwork for your music, click the little music icon to select the MP3 you want CoverChooser to scan, or use the folder icon to choose a folder that contains music. CoverChooser will scan the music and fill in the fields for you. It will also start grabbing artwork from some of its supported websites, which include Last.fm, Discogs.org, Amazon.com, Google Images and Wikipedia. You’ll also notice – if your music already has cover art associated with it – an image to the left of the Artist & Album fields. This is the selected artwork already in place. 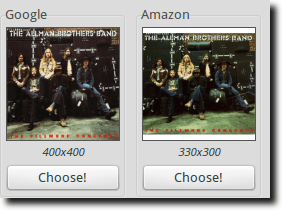 Once CoverChooser has searched for, and found, new cover art, you can replace the default, if you choose, with one of the new images, simply by hitting the Choose button beneath the cover art you want to use. Before you do that, however, CoverChooser has some basic editing features. Not every piece of album art is perfectly square. Sometimes they’re a bit wider than they are tall, other times the opposite is true. CoverChooser gives us four different ways to modify the art. Those are the four buttons grouped together like this. These buttons allow you to resize, scale and crop the image, all with the aim of filling a square space. You can also choose to keep the image, even if the sides aren’t of even lengths. There are also two other buttons, which improve the image’s color (think of the “auto fix” feature found in many image editors), as well as a button that converts the image to black and white. When you’re finished, simply hit the Choose button beneath the image you want to use, and CoverChooser will download the image and place it in the folder with the music. Note: this will replace any image already in the folder. CoverChooser doesn’t offer much in the way of customization, but there are a couple things you’ll want to look at. First is that you have the ability to choose what filename is given to your new artwork. This can be anything you like. 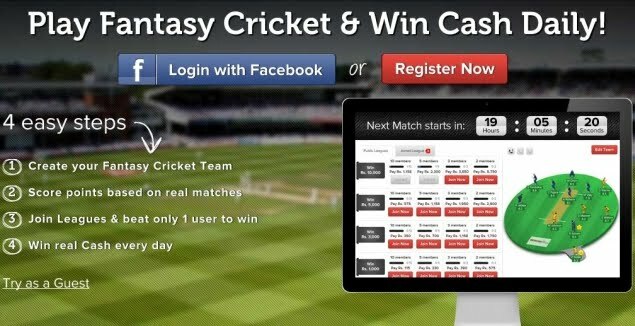 You also have the option of entering in API access codes for a variety of services. In our testing, no API was needed (nor could one be easily found) for Discogs or Last.fm (those sites “just work”), but you will need one for Amazon. To get an Amazon API (completely free), go to aws.amazon.com (you can use your regular Amazon account), and follow the instructions. 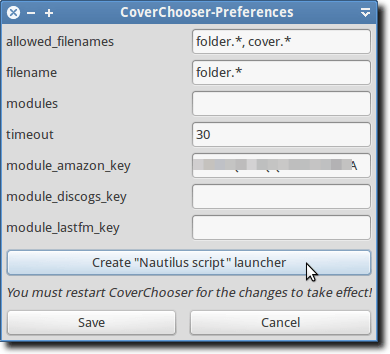 Finally, if you click the large button near the bottom, CoverChooser will install a Nautilus script. 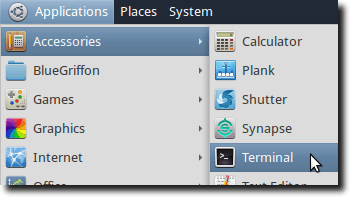 Once installed, simply navigate (in Nautilus), to a folder with music in it. 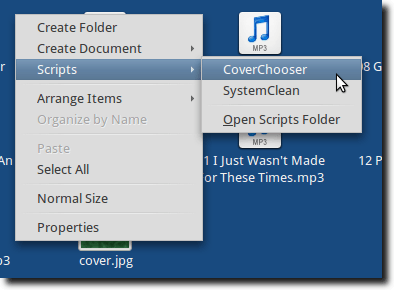 Right-click, and choose CoverChooser from the scripts menu. CoverChooser will launch, with the fields already filled in, based on the folder you were in when you launched it. All in all, CoverChooser is a pretty nice utility. It’s not something you can’t find anywhere else, but if you’re looking for a simple, no-frills method of finding and downloading cover art, it’s a nice program to use.